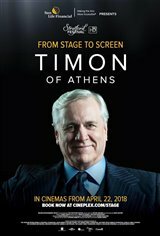 Athenian nobleman Timon (Joseph Ziegler) is known for his generosity as he gives lavish gifts to his friends and entertains them with extravagant hospitality. When his money runs out, he asks his "friends" for help but they refuse him. So he throws one last party revealing a dramatic change in his attitude to the world.